After all the applique that’s been floating around here lately, we needed a change of pace. Weftovers is just what we needed to shake things up a bit! Weftovers, like so many of our quilts, has a story. It originally started out destined to be a graduation quilt for a good friend’s daughter. 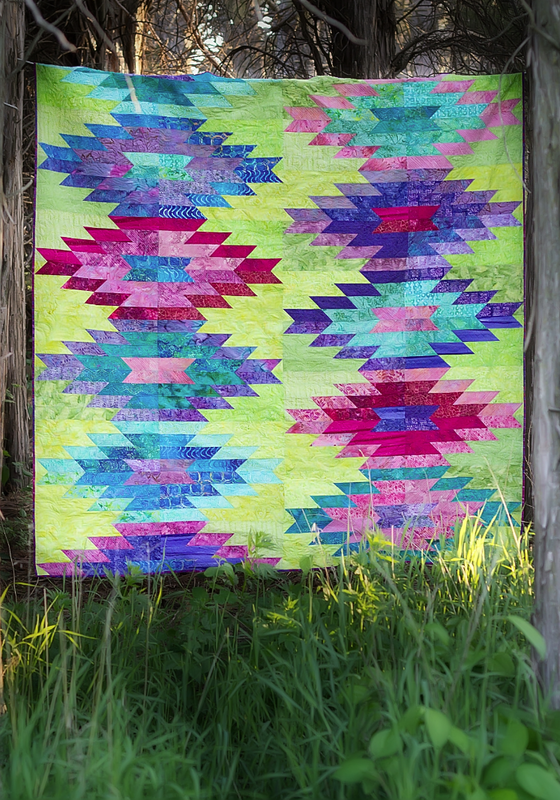 Its spiky-spunky design inspired by woven blankets and bright funky colors should be sure to please a teenager, right? 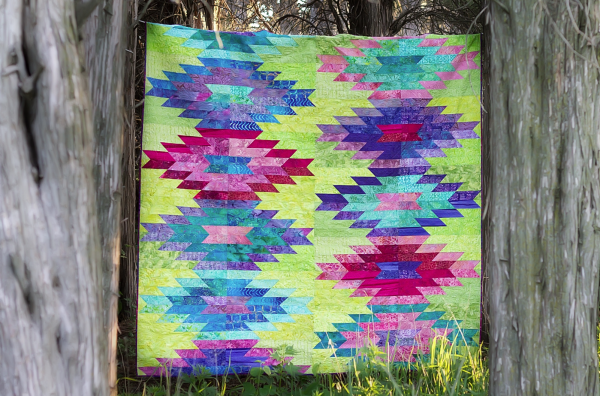 And lime green, turquoise, aqua, pink, and purple batiks are so good together. Who wouldn’t want to take this out with them into the world?! But no one told me that 17-year-old girls list beige as their favorite color. Who knew? This quilt never made it to college, it was left behind. But we love it. Our inner 17-year-old girls are happy with their Weftovers quilt. Finishing right at 80 1/2″ x 80 1/2″, Weftovers is a good full sized quilt or a small queen sized quilt. Weftovers uses a variety of 2 1/2″ strips to construct the blocks, so it is possible to make it with jelly rolls or bali pops. However the pattern was not written to accommodate them. We’re oh-so-slowly switching over to new pattern fronts with all of Alyx from Everyday Adventures Photography’s beautiful photos. They look quite spiffy if we do say so ourselves!